Happy Digital Scrapbooking Day to all you talented designers out there! If you're confused as to why the link to Scotty Girl Design took you here, well let me try to explain as quickly as I can: I retired from digital scrapbook design in June and decided to shift my focus to surface design, but also to be able to devote more time to helping digital designers (like yourself) streamline their businesses and maximize their design time. If you'd like to know more about how I came to my decision, you can read about my 3 main reasons for retiring. Now let's get to the reason you're really here – your FREEBIE! When it came time to design something for this blog hop, I didn't want to do my "usual freebie"; I wanted to create something that could really help you in your business each week. Below is a set of brainstorming worksheets designed to make your design time much smoother. All you need to do is take an hour before you start designing and write down or sketch all your ideas for your next collection. Click the image below to start the download. The set above is for letter sized pages, however, I don't want to leave all the planner gals hanging, so I've made an A5 size as well. CLICK HERE to get the A5 size instead! 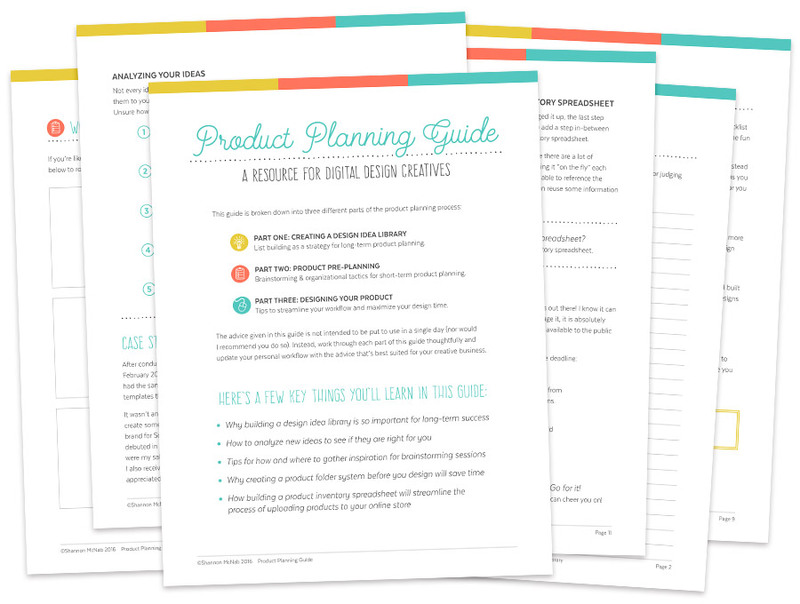 Next up in the blog hop is Wendy Page Designs, but if you like my brainstorming worksheets and want another FREE design resource to help you plan your products, don't hop outta here just yet! Make sure you scroll down to the bottom of this post. I'm sure all you designers out there have been working hard for weeks to get ready for this weekend! To celebrate this amazing holiday, the entire SHCo store is 60% off from October 1-3 – including 7 new products of mine (one is a HUGE textures bundle for only $10). I wasted so much design time in my first few years as a digital designer and the main reason stemmed from not doing any pre-planning; I just jumped straight into design mode. If I had only taken a few hours each month to build a solid plan for future products, I would have saved myself HOURS of time. So over the last two years, I dedicated a lot of time to developing my own product planning system so I could stop wasting time and I want to share my system with you. If you ever feel like you don't have enough hours in the day for design or are constantly scrambling to put together new products each week, this guide can help. In the 12-page guide, I share with you my three part system that I personally used over the last two years. I lead you through each part step-by-step so by the end you can implement your own product planning strategy. When I first started designing digital scrapbook products back in 2010, I had no idea what I was doing. I’d be full of inspiration one week, only to be scrambling to come up with ideas the following week. Sound familiar? I wasted so much design time in my first few years as a digital designer and the main reason stemmed from not doing any pre-planning – I just jumped straight into design mode. If I had only taken a few hours each week (or month) to build a solid plan for future products, I would have saved myself HOURS of time. Creating new designs is easier when you already have several good ideas to choose from instead of trying to come up with something on the fly. When I realized this, I decided to devote an entire day to building a list of possible theme ideas for future products. Now you definitely don't have to take a full day to build an ideas list, but even 1-2 hours of focused brainstorming can easily give you at least a dozen good ideas for products down the line. This is one step in the product planning process that is often ignored since we have so little design time to begin with, but to me it should always be the FIRST step in building a solid pre-planning system. Many designers (myself included) will often think of an idea and just start designing. This spontaneous method of creation can be a healthy part of the design process when you're wanting to experiment or stretch your design skills. However, when it comes to developing a fully realized product (especially if it's a multi-product collection), I think going in with a bit of a plan is a much better place to start. By spending just an hour or so brainstorming ideas, you'll be giving yourself a plan of attack and visual cues that will help you during the design process. And by creating your own mini product plan, it means that if you get stuck at any time while you're designing, you can just revisit your plan and know what step needs to come next. Without a plan, you'd probably end up wasting more time looking for inspiration to give you new ideas. It's such a great feeling to look back on your day or week and feel like you got a lot accomplished. That's because everyone likes to feel productive! And I don't know about you, but feeling productive is one of the main things that keeps me motivated to work on "the next thing" on my to-do list. That's why I love creating a product list anytime I make a new collection (you could also do a list of tasks needed to complete a single product) because I can immediately see how far along in the design process I am. And nothing beats the feeling of getting to physically check something off a list – it can really empower you to keep going! So how do you create an easy to implement product planning system?? Well, I'd like to share with you the three part system I developed and personally used for the past two years! In my new FREE Product Planning Guide, I lead you through each part step-by-step to help you implement your own product planning strategy and gain back some valuable design time.